Roger & Russell: Magic & Showmanship! 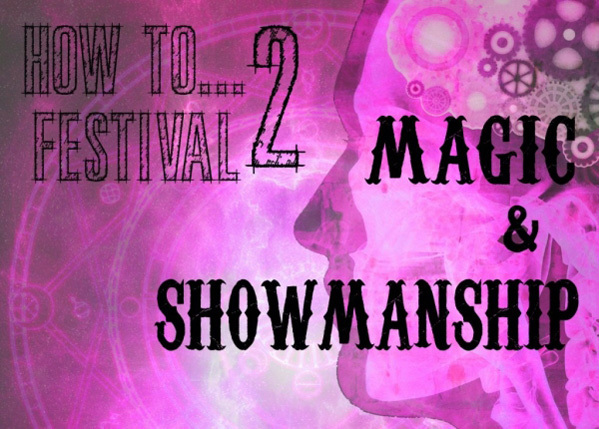 Roger Curzon and I are scheduled to repeat our slightly acclaimed excursion into the rarely-trod byeways of magical history and performance for the experimental theatre company Slung Low in Leeds this Sunday from 3:30 p.m. I’m opening with an illustrated exploration of the curious history of magical invention, followed by Roger who will weave strange, magickal tales around the bizarre curios and artefacts discovered in his late, unlamented Uncle Albert’s suitcase. The day starts tastily at 11:00 a.m. with Manjit’s Kitchen where she will demonstrate how to cook delicious vegetarian Indian dishes and curries, and you can then have a go at creating them yourselves – all ingredients and equipment are provided. As I said, Roger and I will be strutting our various stuffs from 3:30 p.m., including a dab or two of performativity as the occasion demands. Then at 5:00 p.m. Professor Vanessa Toulmin will take you on a filmic tour of Edwardian Leeds with live piano accompaniment presenting pioneering films of showmen Mitchell & Kenyon in Leeds. If you’ve not seen this presentation before, I highly recommend you catch it. Click here for more details. There’s a break for dinner at 6:00 when you can enjoy delicious food from Manjit’s Kitchen and refreshments from the HUB’s £1 bar with free tea and coffee. Plus live music from Bianca Gerald before rounding off the day with a hilarious performance for grown ups from Myra Dubois – Auntie Myra’s Fun Show is at 7:30pm. I understand that there is a very limited capacity for all Festival workshops and performances so to reserve places please email boxoffice@slunglow.org with the number of places you wish to book for each event and a contact telephone number. All events take place at The HUB, 67-71 Bath Road, Holbeck, Leeds, LS11 9UA. There’s free on-street parking on Bath Road on Sundays. A question for magicians: There are copyright for inventions of magic news effect or technic? An interesting question, and one that has impinged on both Roger and myself from time to time. (In respect of Roger’s ‘Curzon Envelope’, for example, which has been appropriated by two USA dealers without acknowledgement in the past.) Technically, copyright authomatically exists in the instructions for a trick, but it is difficult to copyright an effect, a principle or a technique. Clearly, there are many tricks which use principles and techniques that have been invented and developed by others. If someone puts out an effect that is a development or variation of an exisiting trick then it is good manners to check with and acknowledge the original inventor. Over time, tricks and techniques move into the public domain (eg, Burling Hull’s Svengali Deck principle, etc.). Although I would maintain that anyone putting out a ‘new’ trick should always try to acknowledge its ‘parents’. We all stand on the shoulders of giants. A blant rip-off of a new trick (and often its packaging too!) is clearly illegal in most countries, and immoral anywhere. But, sadly, it happens. Thank you very match for your information and opinion. A magical lawyer told me that there is no possibility of protecting the copyright of inventions of magical effects. Just to pay a lawyer to make a process can cost a lot more than you can get at best. I suppose that many inventions and magical effects of improvements die with the authors for missing the opportunity to protect the rights of inventors. I have the original magical effects of inventions that would like to market selling my copyright to those who perform the manufacturing and marketing. If there were UN international laws or any international organization and free or economic easy records would be a means of promoting progress for magic and for many sciences, arts and shows. I tried to register an invention but cost € 3500 only for Italy and hundreds of thousands of euros for the whole world. Record a video DVD from a magic conference costs € 10,000, not compensating for most authors. Copies without paying anything to the authors are on sale and some say it’s legal because they did not pay the € 10,000 for the protection. For a few hundred euros can buy up copies of more than 1,000 magicians conference which had spending money and time without receiving anything. It is certainly unfair and immoral. If the authors and inventors were awarded for their work would be more stimulated to produce more and better inventions not only for the benefit of magic shows and fun but also to solve many world problems and save many lives. What can we do? 1-To promote ethics and global morality fighting and punishing at least morally and public opinion online unjust and immoral behavior? 2-Appealing to the UN to create global standards free protection or economic and easy recovering benefits fines of international justice against the worst?